We are pleased to announce that our labels for VAPY Complex PLUS nicotine free, intensive e-liquids were entered into FINAT International Labelling Competition 2017 and received a recommendation in category A15 “Sets of labels”. Awards report available here: FINAT 2017 report. We are on pages 9 and 12, in the Highly Commended Winners section, group A15. Over 65 Chemnovatic products now fully registered in the UK. We have just received information, that all products we have applied for registration in the UK (that includes over 30 products we have registered for our customers) have had their status changed from “Under review” to “Declared”. Great news for us and our customers, who have decided to choose our services. If you are looking for a professional, custom tailored service including laboratory tests, certification, preparation of all required documentation and finally TPD notification simply contact us. Many customers have already benefitted from our help, join them. TPD compliant e-liquid packaging. Part 1. 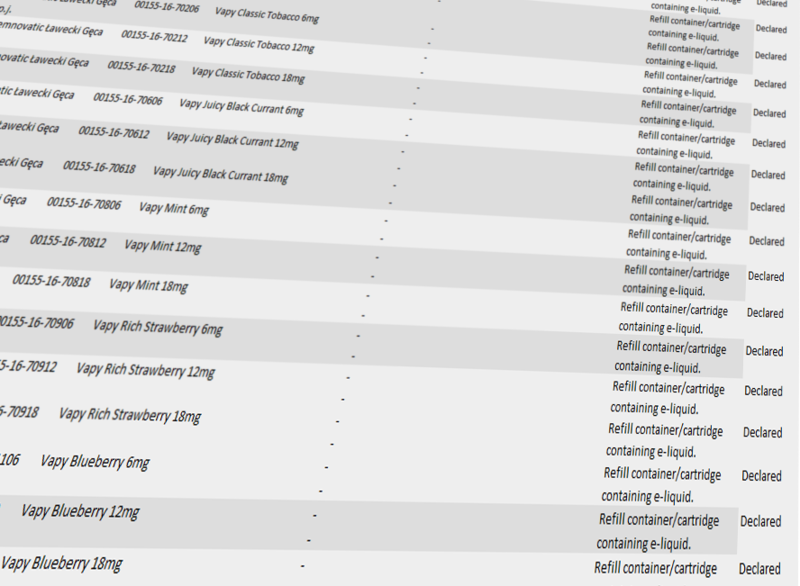 With the new Tobacco Products Directive (TPD) on the way, there is much confusion among the e-liquid manufacturers: “What do I need to do to be TPD compliant?”, “How do I label and package my e-liquids according to TPD?” or “Is my e-liquid packaging good enough for TPD?” and similar questions being raised every day.